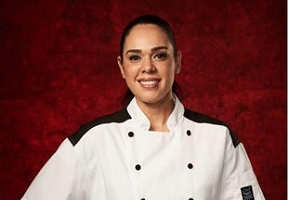 Ariel Contreras-Fox is the new winner of Hell’s Kitchen – Season 18. She is a returning finalist from Season 6 where she ended up in third place. This season she came around and won in the battle rookies vs veterans and in the finale against her opponent – rookie Mia Castro. Fox ended up taking home the $250,000 salary and a shot at a job in the restaurant that sits in front of Caesars Palace. She spoke to Lawndale News before Friday’s finale to tell her thoughts on the show, winning and cooking. How do you feel? Everyone cheered for you to win? Things are exciting! It is a completely different experience this season than it was last season. It is nice to see people supporting me. Competing the first time I developed new sound philosophy in life. I started embracing what makes me uncomfortable. In doing this competition I look at the uncertainty as an opportunity and the challenges as motivating. I welcome chaos and confusion all around me. My motivation was looking at things that scare me the most and create power. What set you apart from the rest of the competition this season? What set me apart is a lot of chefs in the show do what they know and stay in their comfort zone. I thrive of doing something that I have never done before. This is what stands out for Chef Ramsay. Every time I make something new he asks if I made it before. I challenge myself to make it and I did it in 45 min. Does Chef Gordon Ramsay have a soft side we don’t get to see on the screen? Everyone gets to see Ramsay so harsh and screaming. In all of his shows he has this approach and that’s how we know him. What I love most about him as a mentor is that he is approachable, has such a wealth of knowledge and I can talk to him about everything in life. He will always give you such a true and sincere answer. How has your career changed since you were last on the show? I decided to move to NY after I filmed the first time. That was the turning point for my career and when I really upped my own game for myself. I took a job with a renowned chef. I am very proud of that project and my career went off. I haven’t looked back since. What does it take to be a successful female chef in America? Being a female chef and a new mom is challenging. It definitely makes you stronger. Every day is filled with uncertainty and there is always a new challenge I wake up to. It’s a lot to work in this big city and oversee the number of restaurants and I have a family but it’s all part of the process. I am very careful about setting goals for myself. I am very specific with what I want and do whatever it takes to get there. I have two favorite cuisines – Mexican and Italian. The Mexican because I grew up in California. Italian is my second love and my favorite place to travel. The ingredients there are so much better. I am devoted to cooking steak and seafood. I want to thank everyone who has been watching and supported me since season 6. My advice is really to not worry about these shows, stay true to yourself and if you love to cook and that’s where your heart is you will find success because food is love. Fox is an accomplished chef having spent time innovating in some of the most prestigious kitchens in the industry and helping launch several nationally renowned restaurants including STK, Harding’s and ACME. 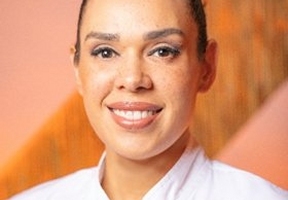 Currently, she’s the Concept Executive Chef at Dos Caminos.